I looked up to the sky from behind the car’s window, and it was drizzling outside, as if the sky was spilling out all of the pressure it had slowly, just like what I was going to do. Me and two of my friends—Sekar and Dias, were in an online taxi which was taking us to MS Hall – Viky Sianipar Music Center Jakarta. 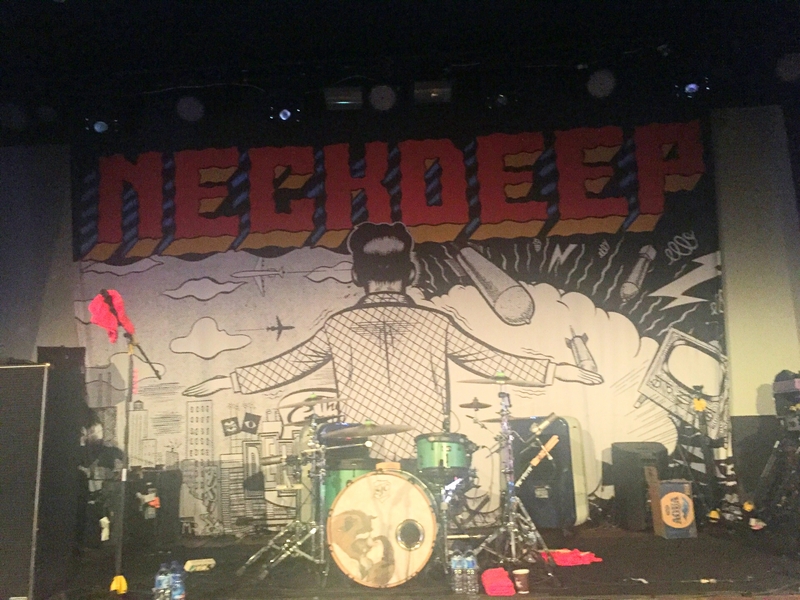 In this place, we were going to see our favorite British pop-punk band Neck Deep for the first time. I was so stoked! We arrived at 3:45 p.m and when we stepped out of the car, we were greeted by the rain. The gate was supposed to be opened at 5 p.m. We waited outside the building as the rain slowly stopped. The place was relatively small compared to how many people attending this event. We barely had a spot to cover ourselves from the rain. I could see the excitement in everyone’s faces because it was one step to meet our favorite band. No one could hide it despite the rainy weather, really. At almost 5, everyone started to wait in line in front of the gate. It was still drizzling lightly but we could care less for the sake of getting the front row! We were supposed to enter the hall at 5 p.m sharp but it annoyingly got delayed for nearly an hour until the gate was finally opened. Dear God I could barely feel my legs anymore. To add up my annoyance, we were also not allowed to bring any drinks from outside the venue. The second we were allowed to enter the hall, the three of us quickly raced with others to get the front row and luckily, we got it! The hall was not as big as I thought it would be with hundreds or maybe a thousand people attending this concert, but I did not mind it. Before the show started, I still could breath easily before the other audience pushed themselves to the front. We waited again for nearly an hour until we were presented by two opening acts, Rocket Rockers and Patriots. The air surrounding me suddenly changed the minute Rocket Rockers stepped into the stage. I had gone to some music concerts before, but it was my very first experience attending a punk/rock concert. I got panicked when the audience (which was mostly filled with boys) were starting to do mosh pits. I had already known what you could expect from a punk concert, but I had never imagined myself being a part of it. For so many times I got pushed from every direction, and my head got hit by people doing the stage dive. It was just the beginning, for heaven’s sake! At that time, I did not think I would be able to survive until the end of the show. I prayed to God that these boys would stop doing the stage dive—or at least in my direction, but of course, it did not happen. At that rate, I thought I could have had a concussion from the hitting. I felt like my body was like a ship tossing around in the middle of an ocean because of the waves. After two hours or more, finally, all of the agony I felt was now nothing when my favorite band stepped out into the stage. Oh, what a time to be alive! Ben Barlow, my favorite vocalist ever, stepped into the stage followed by Sam Bowden, the guitarist and also my man crush, Matt West, the guitarist, Fil Thorpe-Evans, the bassist, and Dani Abasi, the drummer. When Happy Judgement Day was played, suddenly everyone lost their minds, and I was no exception. I could not feel the air around me anymore and at that time, I did not care a bit. The pushing had gone even wilder, I could not move my body at all because everyone pushed me from every direction. My mind was gone crazier when I got to touch Ben and held his hand. I thought I was going to die but that was okay because then I would die happily. The crowd was even no longer in control and exactly at that moment, Dias was separated from me and Sekar. I was concerned about whether she was okay or something happened to her. I wanted to look around to find her but I could barely be able to move my body let alone wandered my sight to find her. The band brought 15 songs in total but only after halfway there, I gave up maintaining my spot in the front row. Sekar asked me if I would go to the back so we went outside for some minutes to catch some air. She was also as dead as I was. We bought two bottles of water because we also ran out of energy from the crying and screaming. After we regained our energy, we went inside the hall again, but this time both of us did not even care about standing in the front row anymore unless we wanted to kill ourselves for real. We agreed to stay at the back because there were still a lot of empty spaces since most of the audience wanted to be as close as possible to the stage, plus, I still could see the band clearly since the place was so small. From the back, I felt like the hall was ten times bigger than when I was in the front. The atmosphere of the room immediately changed the second they played Wish You Were Here. The audience and also the band were getting so emotional, including me. No one pushed anyone because they were too absorbed in enjoying the song. I could sense the feeling of peace radiated from the entire room as we all sang along with the band. At 11:25, the band said their goodbyes and played the last song Where Do We Go When We Go. I was sad because I thought the show would be longer but a little part of me was kind of relieved because I had drained myself too much and I needed a good food and good sleep. Sekar and I went outside and it felt like heaven when the night breeze hit us. Outside the building, we met Dias again and thankfully she was okay. We stole some bottles of drink from earlier when the crew took our drinks then we stepped aside and sat down for a while because we did not think we could stand on our feet any longer, let alone walking. After we were done resting our legs and we had enough oxygen in our bodies, we decided to go back to the hotel and ordered some food. God, I was starving. Coming to The Peace and The Panic Tour and seeing my favorite band was the best experience ever. Even though attending a punk concert was like sacrificing yourself to the sea of wild people, but I was the happiest when I got to see my favorite people. I will forever remember the place where I got to see my favorite people and I am so grateful because of the small place, there was no barrier that could stop me to be able to touch Ben. I am looking forward to go to more punk concerts from my other favorite punk bands.